The New York Knicks centre expressed fear that he could be assassinated or kidnapped by emissaries of Turkish President Recep Tayyip Erdogan after criticising Ankara's policies. 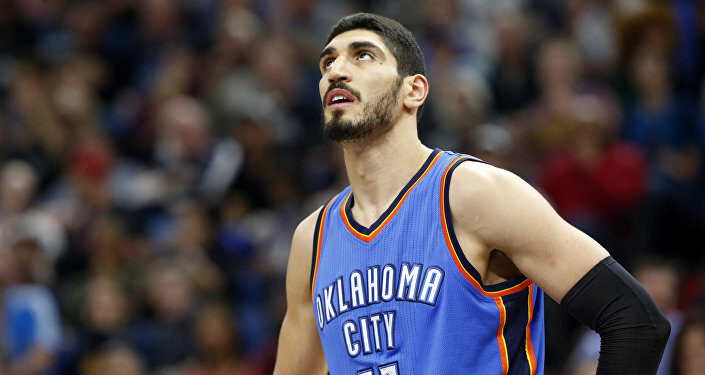 NBA player Enes Kanter said Friday that he would not travel with his team to London for a January 17 game against the Washington Wizards as “there is a chance I could get killed out there […] It’s pretty sad that all the stuff affects my career and basketball because I want to be out there and help my team win", Kanter, a Turkish national holding permanent residency in the US, told reporters after the Knicks defeated the Los Angeles Lakers Friday night. — Ohm Youngmisuk (@NotoriousOHM) 5 января 2019 г.
Ankara revoked Kanter's Turkish passport and a court in the Middle East's most populous nation declared the basketball player a defector for his support of US-based Islamic cleric Fethullah Gulen, whom Erdogan accuses of orchestrating a failed coup in July 2016. Gulen has consistently denied involvement in the coup attempt. Erdogan's administration has repeatedly attempted to blame Gulen and his followers for the 2016 military coup attempt in Turkey aimed at overthrowing the president. The coup was promptly suppressed, leaving over 2,000 injured and some 250 dead. Ankara has arrested and jailed thousands of people, including media personnel, law enforcement officers, educators, academics, and intellectuals over suspected links to Gulen's movement. Turkey has sought Gulen's extradition from the United States since that time. The Anadolu news agency reported in December 2017 that a Turkish prosecutor had demanded that Kanter be jailed up to four years for the crime of "insulting" Erdogan. The New York Times said, citing a Knicks official, that Kanter would not travel to London this month due to the visa issue presented by his passport's cancellation. Turkey’s Idlib Operation: Coup De Grace or Quagmire?